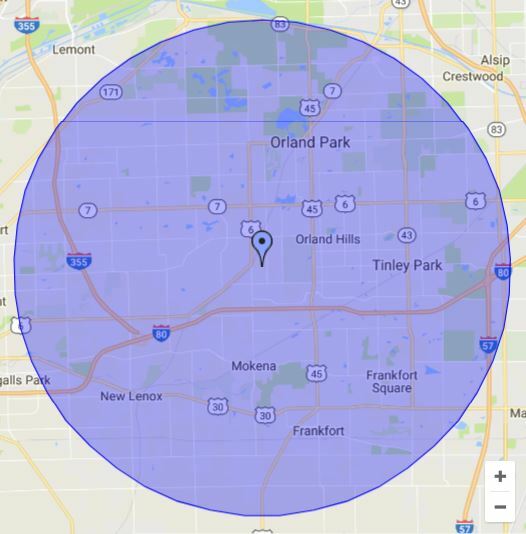 Proudly serving Orland / Tinley Park, IL & surrounding areas since 1991! We are a great team of experienced and knowledgable heating and cooling technicians. 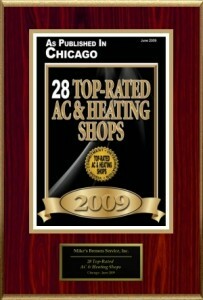 We have been rated as one of the top air conditioning and heating companies in the Orland Park area. Ask any one of our employees or long-time customers to see how we can help you with not only your heating or cooling units, as well as all of your household appliances. Count on Mike's Bremen Service to get the job done! We not only are skilled in helping you with heating or cooling issues, but we are also qualified to look at all of your major household appliances. This includes anything from your refrigerator to your freezer, from your dishwasher to your washer and dryer. We can look at them all and recommend the best course of action for you to take. So please call us if you are having problems with any of these! We are big believers that you should feel the coolness of a air conditioner in the summertime to keep out the summer heat and that you should feel the warmth of a heater in the winter to keep out the winter cold. We are specialized in helping your cooling or heating unit maintain its correct temperature, so you're not worried about your home temperature. We want to help your family stay comfortable in your home. We service and sell energy-efficient A/C units. We service and maintain most major household appliances. We have great deals going on all the time! "We offer competitive financing. Please contact us for details." Your home is where your heart is—but it's hard to feel comfortable and happy at home when your HVAC system malfunctions. If your furnace blows cool air, your air conditioner refuses to kick on, or your humidifier springs a leak, call Mike's Bremen Service. Our professionals arrive at your home quickly to diagnose the issue, and we offer you an upfront quote on any repairs before we get to work. Get in touch with us as soon as your HVAC system experiences any problem, and we'll have your A/C or heater up and running again in no time. No matter where you live in the Chicago area, you're used to harsh winters and hot, humid summers. If your air conditioner fails in the summer or your heater breaks down during a snowstorm, you need quick, effective service that will restore your home's previous comfort level as soon as possible. 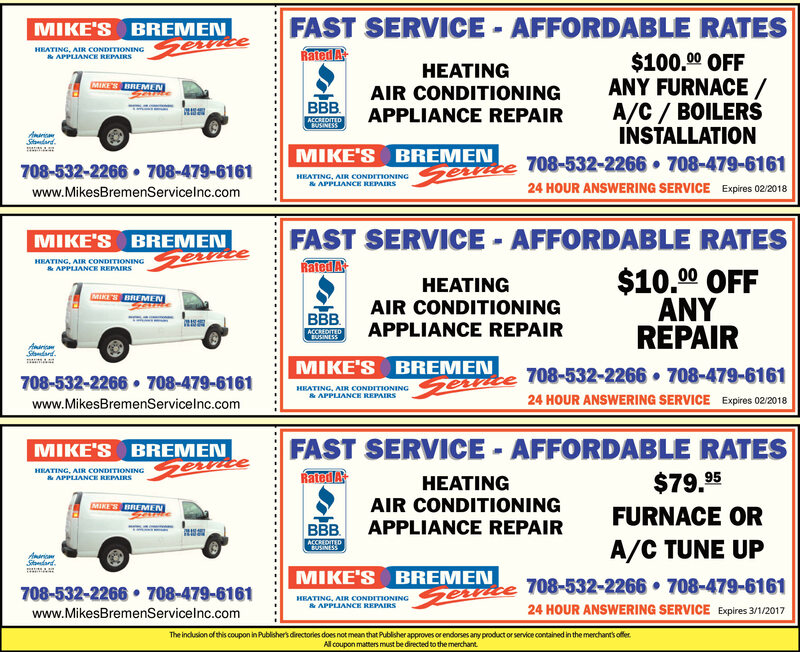 At Mike's Bremen Service, we provide all the heating and air conditioning services our customers in Orland Park, IL depend on. Turn to us for repairs, replacement, and general maintenance services that extend your HVAC appliance's lifespan and enhance its efficiency. 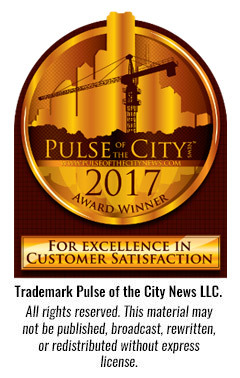 Since 1991, our founder, Mike, has worked hard to give clients across the area dependable service at a reasonable price. We don't believe in a one-size-fits-all solution—we take the time to analyze your system and offer the custom fix you need. Along with servicing all HVAC appliances, we can evaluate and repair most major household appliances. If any appliance from your air conditioner and heater to your washing machine and refrigerator malfunctions, get in touch. Whichever appliance we repair, we offer a 30-day warranty on all labor. You can reach us at (708) 532-2266 or (708) 479-6161.